Hasbro UK Releases - Page 15- BLOOD FOR THE BARON!!! Finally! I have the 1991 UK flyer. I still need the 1993 flyer, do you have it? wasn't that the one i scanned for you with the X-16 Ghost Striker and the Star Brigade vehicles on? I mean the full size one with figures. Anyway, I got this cool Action Force AWE Striker yesterday. All the green parts, except the main body, is a cool army dark green. Were this version released in other countries besides Europe? I got it from a Danish childhood collection, and it has a few Action Force stickers + included AF blueprints. I read on YoJoe that it is a supposed variation. I have three other Action Force AWE Strikers, but they are all light green allover. I've never seen that! Are you sure it's genuine? Not an amalgamation? Do the dark green parts match any known AWE Striker release? The Baron wrote: I've never seen that! Are you sure it's genuine? Not an amalgamation? The plastic is also the same quality as the rest of the vehicle, so I highly doubt it. Also, I got it from a childhood collection, and everything included was in good shape and near complete (and nothing other non-European stuff was included), so I highly doubt they would have switched out parts. It even included the blueprints. 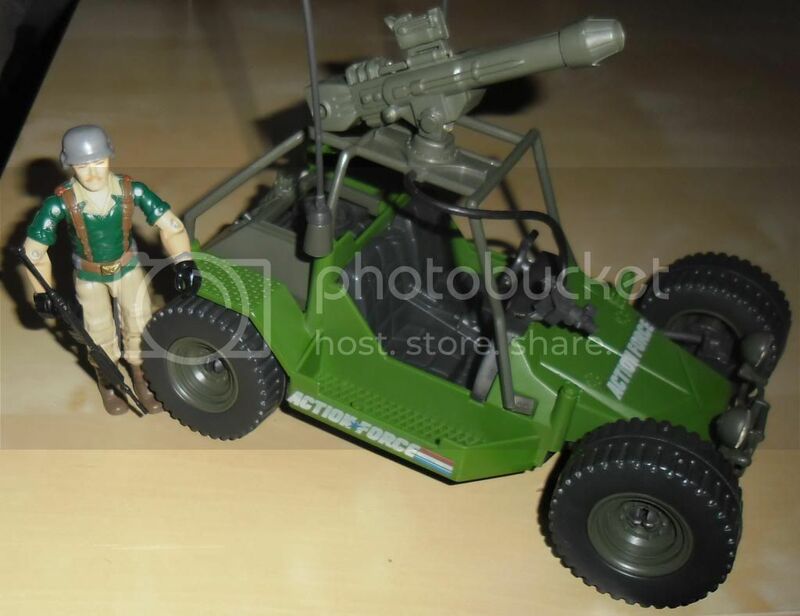 A dark green version is also noted under 'possible variations' on YoJoe, so that might be this? "A.W.E. Striker - light or dark green"
yeah, slaughter was to violent for the UK, same issue arose with the ninja turtles, they became lame heros.